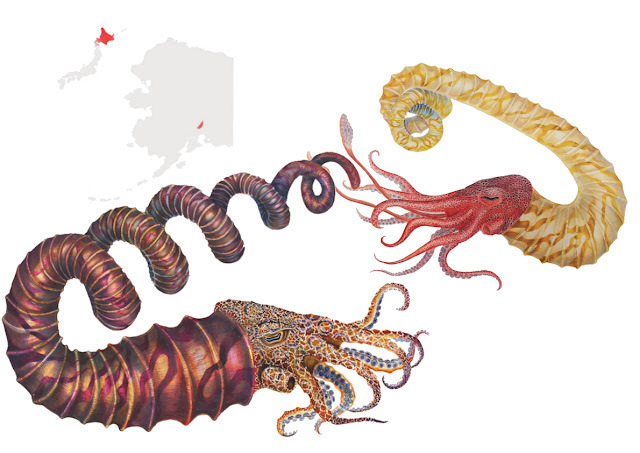 Two heteromorph ammonoid cephalopods whose conches are endemic to the Upper Cretaceous strata of the Matanuska Formation of Alaska and analogous units on the island of Hokkaido, Japan. They are here reconstructed using internal shell structures, analysis of the matrix, and other features at the species level. Left: Eubostrychoceras japonicum, macroconch. E. japonicum is notable for sinistral and dextral intraspecies coil variation, and a drastically enlarged living chamber is present in only about half the known adult specimens. This likely indicates a brood pouch, denoting a female individual, here imagined employing defensive aposematism. Right: Muramotoceras matsumoto, identifiable by its knotted phragmacone separated from its living chamber by a long U-shaped shaft.